INDUSTRY.co.id - Jakarta - United Nations Environment Program Executive Director (UNEP) Erik Solheim praised Indonesia's steps to restore the peat ecosystem and assesses that the effort has been successful and deserves an example as any other country. "The destruction of peat lands around the world will be a major blow to the Paris Treaty and for future generations," Solheim said in a press statement delivered by the Ministry of Environment and Forests (KLHK) on Friday (23/3/2018) Partner of the Global Peatland Initiative (GPI) in Brazzaville, Republic of Congo, Thursday (22/3) local time. Solheim said the international community is paying attention to Indonesia as one of the world's largest peatland areas with an area of ​​more than 15 million hectares (ha). The great forest and land encroachment (karhutla) of 2015, especially the very difficult peat fires, the President Joko Widodo's Government effectively enacted a policy of improving peatland governance as a national priority, through the issuance of legislation and real-time steps in the field to prevent recurrence peat fires. 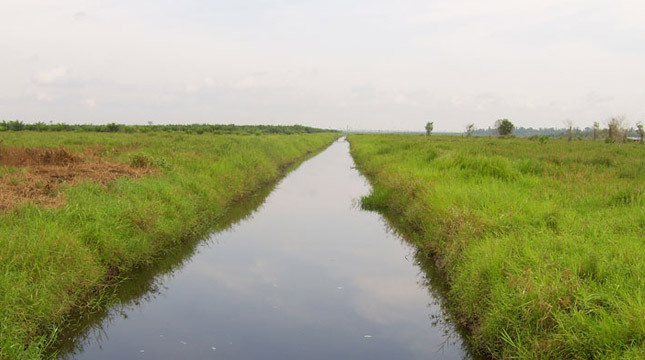 Therefore, Solheim also requested the Republic of Congo and the Democratic Republic of Congo to learn from Indonesia's experience in the recovery of peat ecosystems. "The Republic of Congo and the Democratic Republic of Congo must learn from Indonesia," he said. At this meeting Indonesia's Minister of Environment and Forestry Dr Siti Nurbaya Bakar was present as the keynote speaker. Also present was Prime Minister of the Republic of Congo Clement Mouamba, Environment Minister of Democratic Republic of Congo Amy Ambatobe Nyongolo and Environment Minister of the Republic of Congo Arlette Soudan-Nonau. Siti Nurbaya explains that the great karhutla of 2015, especially peat fires, is a very valuable lesson for the Government of Indonesia so that the government responds through policies to make strict and comprehensive peatland governance improvements, especially in the context of preventing the recurrence of peat fires. "The result of the period 2016-2017, Indonesia succeeded in reducing the fire point as much as 93.6 percent.This success is a testament to the seriousness of President Joko Widodo make the prevention of karhutla which mostly occurs in peatlands as a national priority, and succeeded in realizing policies in effective action in the field, "said Nurbaya. Nubaya emphasized that one of the keys to Indonesia's success is the ability to effectively involve all parties in this great work, from community organizations, including encouraging the fulfillment of private sector legal obligations related to peatland management in their concessions. The real effort of President Joko Widodo's government to set up peatlands has proven to save millions of Indonesians from forest and land fi res and landfills during the period 2016-2017, after routinely occurring for almost two decades. Strict and total peat governance by the Indonesian government by the United Nations Environment Program (UNEP) or the UN Environment program is the best example for all countries in the world that have similar issues. This achievement is in line with the direction of President Joko Widodo and Vice President Jusuf Kalla in November 2015 for Indonesian peatland governance to be internationally recognized. "Because the problem of karhutla that the majorities occur in peatland is universal," Nurbaya said during his visit to the 3rd Global Peatland Initiative (GPI) Working Partner meeting in Brazzaville, Republic of Congo. In the near future the two countries with the largest peatlands in the world, the Republic of Congo and the Democratic Republic of Congo soon learn to Indonesia. "Indonesia will lead" south-south cooperation "dealing with Congo Basin peat for the world," Nurbaya said. Congo Basin or Congo basin includes three countries that have the second largest peatland in the world. These three countries are the Republic of Congo, the Democratic Republic of Congo and Gabon. Besides Indonesia and Congo's duo, the country with the largest peatland in the world is Peru. At the meeting, the 3rd Global Peatland Initiative conference was signed with the Minister of the Environment of the Democratic Republic of Congo Amy Ambatobe Nyongolo and Environment Minister of the Republic of Congo Arlette Soudan-Nonau. Also present witnessed UN Environment Program Executive Director (UNEP) Erik Solheim. "If the peatlands of Indonesia were known to be prone to burning, now on the contrary, be a reference to protect the Congo Basin peat," Nurbayai said. According to her, two ministers from the Congo state will also go to Indonesia sometime in June.